Today, Sunday 18th June 2017 in the United Kingdom is Father’s Day, a day to celebrate the unsung hero’s who always take second place to Mums. There is no denying that fact, on the very odd occurance, some Dads come first. Now, some of you who follow my strange unchronological blog with fictional content will probably have read that my father was a closet musician, once he started dating my dear Mum he gave up his physical music activities, he locked his saxophone away and quietly placed his sheet music at the bottom of his piano stool. One of the greatest gifts along with the love we shared was music, as a child our house was always filled with music, dancing and laughter. But, our tastes were varied, something I wasn’t aware of until after he passed away. How would you feel if someone told you that on the day of his funeral he was a classically trained pianist along with being an accomplished saxophonist, now that is some big information to take in, however, I always knew he was a Rolling Stone fan, his impression of the lead man was far better than Rob Brydon or Steve Coogans, he had Mick Jaggers actions off to a tee and without notice he would strut his stuff without shame. Oh how we laughed. 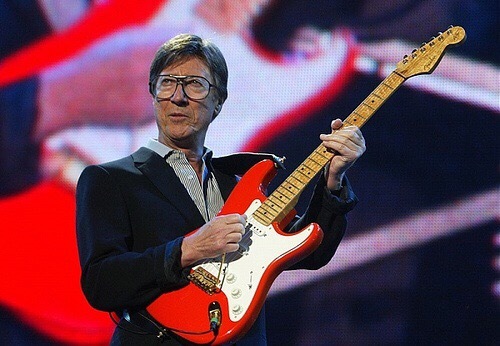 Coming back to the storyline, he was also a great fan of Hank Marvin and Bruce Welch, front line men of ‘The Shadows’ he absolutely adored their music, so today’s ‘concert’ was a happy boost on a remembered Sunday. Tears fall with great joy down my cheeks as I watch Hank play guitar and his foot work reminds me of my Dads impression, if anyone was deserved of ‘Lifetime Air Guitar performer’ then my dear Dad was there, right up front clutching his Oscar and grinning from ear to ear like the proverbial Cheshire Cat. At just, only just for one second, he was there. Happy Father’s Day Dad …….